Other names: Satinash, small leafed lillypilly. Riberry is a fruit from Australia. occurs in North East Queensland and also in south-eastern Queensland and north-eastern New South Wales but apparently absent from coastal central Queensland. It grows in well developed rain forest on a variety of sites at altitudes ranging from sea level to 1500 m.
As riberry has attractive foliage that keeps changing colour with season, so it is planted more as an ornamental tree than as a fruit tree in spite of the fact that it also bears edible fruits. 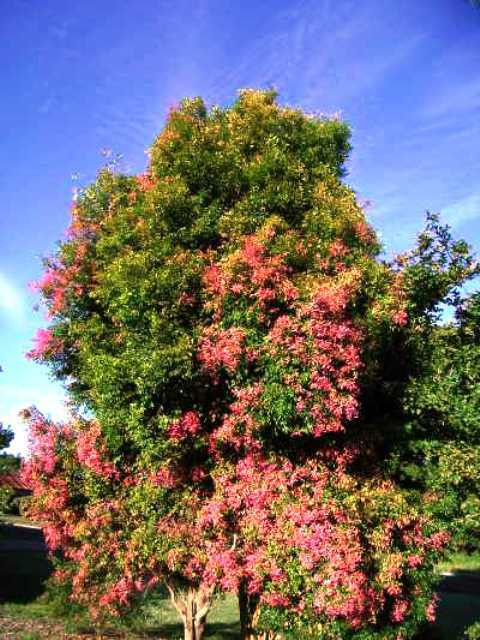 A medium tree 6-8 metres tall; bark reddish brown and conspicuously flaky, the flakes often large. 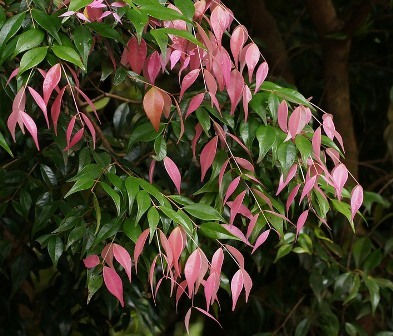 Young leaves and shoots pink or reddish, the whole crown often similarly coloured, leaf blades small, about 3-7 x 1-2.5 cm; lateral veins scarcely visible on the upper surface of the leaf blade but more readily apparent on the underside; leafy twigs glabrous. Inflorescence terminal and in the upper axils, generally rather compact, hidden by the leaves, bracts deciduous, absent at anthesis; flowers +/- sessile; calyx tube about 3-6 mm long, calyx lobes rounded about 1-1.5 mm long; petals orbicular or oval, concave, about 1.5-2.5 mm diam., oil dots visible with difficulty, about 20-40 per petal; outer staminal filaments about 4-6 mm long, anthers about 0.3-0.5 x 0.4 mm, gland terminal, on the back on the anther; ovules about 10-12 per locule, placentas axile or central, ovules transverse horizontal; style about 5-9 mm long, approximating or exceeding the stamens. Fruits globular, pyriform or turbinate, narrowly excavated at the apex, attaining about 7-11 mm diam., calyx lobes persistent, about 0.5-1 mm long, pericarp succulent. Seed solitary, about 2-5 mm wide. Riberry fruits are eaten. They have a clove like flavour. The fruits can be used for making jam, and in tarts, meat sauce, and cakes. The whole fruit can be blended for use in ice cream. Riberry trees are popularly planted in gardens. This tree prefers sunny location and grows fairly fast. 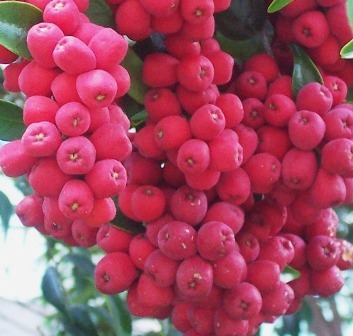 Riberry trees are easily available from most nurseries. Some nurseries offer named varieties too.